Figs B1.1; B2.5; B4.5, 8, 10, 12, 15; C19.1–5. Species recognition. 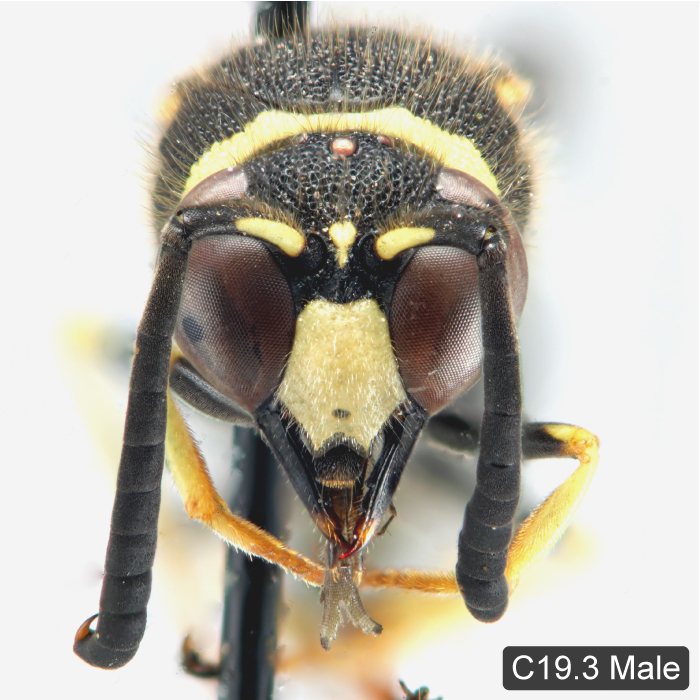 MacLachlan (1980) commented on the difficulties in separating females of E. verticalis and E. crucifera. Both species are very variable in colouration across their largely overlapping ranges. However, a careful comparison of sympatric material of both species often reveals useful colour characters, which are only applicable to specimens from certain geographic areas (MacLachlan 1980). No reliable diagnostic colour characters have been mentioned for northeastern Nearctic populations in previous works (Bequaert 1938, 1944b; MacLachlan 1980). A highly reliable character that is developed in ca. 95% of E. verticalis females is the pair of ventrolateral spots on the propodeum (always absent in E. crucifera). Another character is the colouration of the femoral apex (see key); this character holds up for material from Ontario and Quebec but not the Atlantic provinces. MacLachlan (1980) suggested that clypeal punctation was also diagnostic but this could not be confirmed on the examined material. 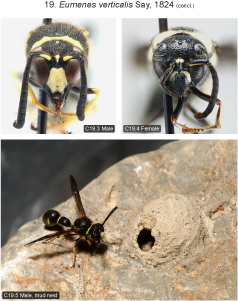 We were able to find only one reliable structural difference between females of both species, the development of the costal scale, which is more produced and sharp-edged in E. verticalis than in either E. crucifera or E. fraternus. Variation. Fore wing length 7–8.5 mm (♂♂), 8–9.5 mm (♀♀). The colour of pale markings varies from yellow to ivory. 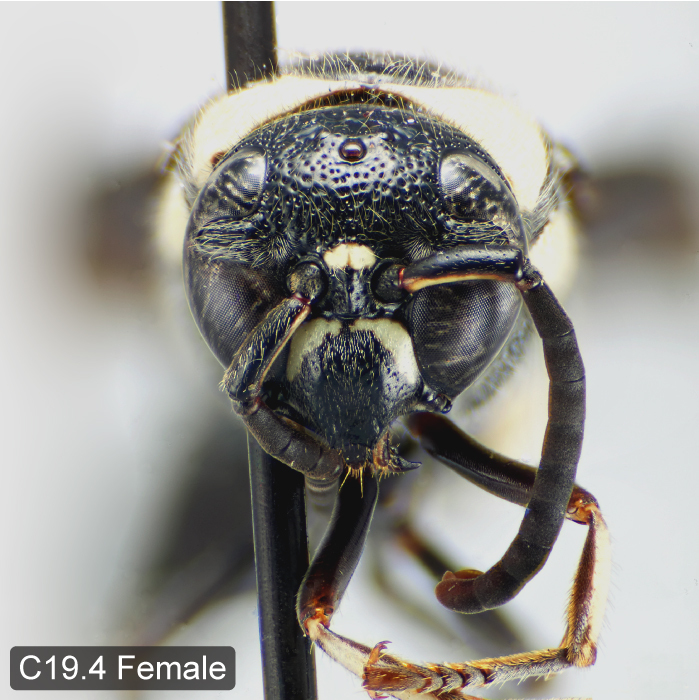 Female clypeus with a pair of more or less elongate dorsal spots, which are often fused dorsally, rarely clypeus mostly yellow with black apical margin and black central spot extending to dorsal and/or ventral margin. Pronotal band sometimes with interruption or indentation halfway between median line and pronotal angle. 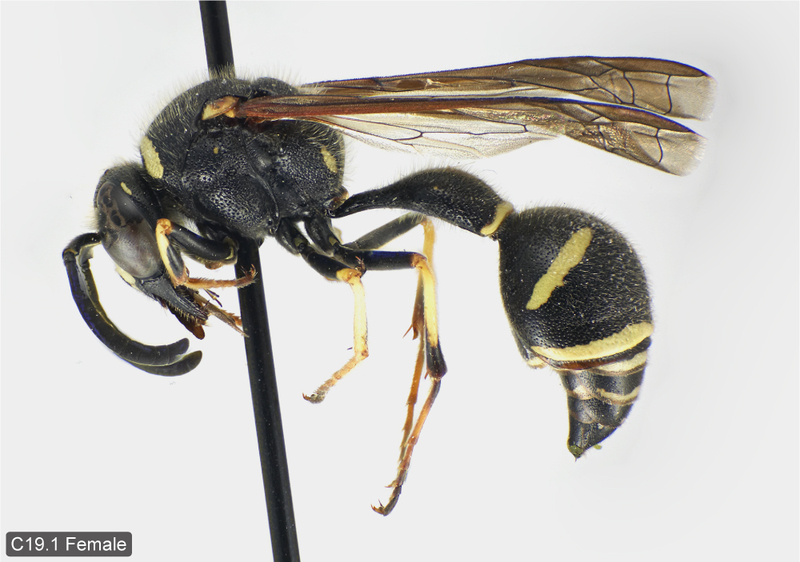 Mesopleuron rarely with small dorsal spot in female. Propodeum usually with a pair of ventral spots, sometimes also with smaller dorsal spots, rarely completely black; ventral spots exceptionally present in male. Apices of fore and mid femora with pale spot, which may be fairly large. Tergum 1 in female often, in male rarely, with a pair of pale spots. Preapical fasciae usually present on terga 1–5 in male and 1–4 or 5 in female. Fasciae on corresponding sterna often only partially developed. Distribution. Canada: QC to BC, YT (Finnamore 1997). Eastern U.S. south to NC, MO; western U.S. (Krombein 1979). Mexico: Tamaulipas, Nuevo León, Baja California (Rodríguez-Palafox 1996). Based on the colour of the pale markings northeastern populations have been divided into two (probably unjustified) subspecies (Bequaert 1944b): the nominate subspecies (yellow markings) and ssp. 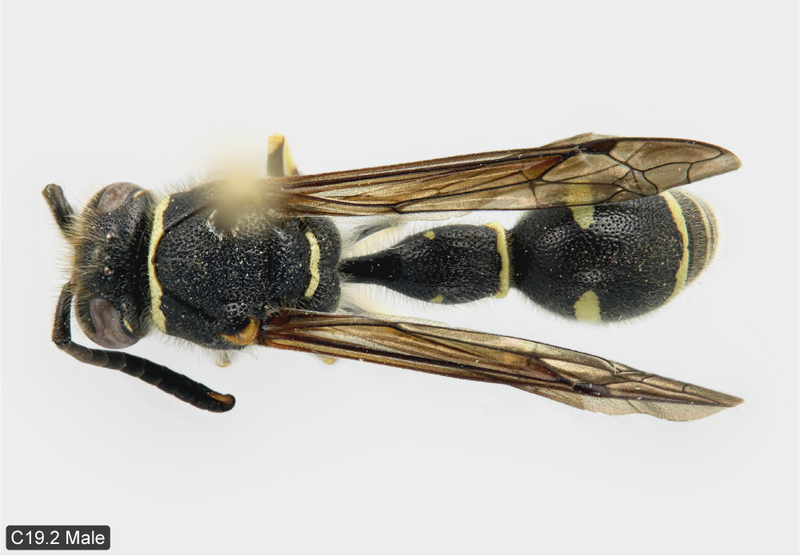 neoboreus Bequaert, 1944 (ivory markings). Two other subspecies, ssp. 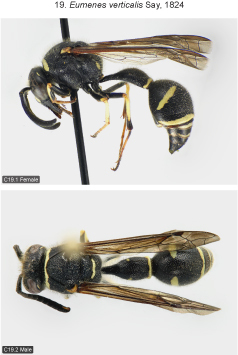 coloradensis Cresson, 1875, and ssp. tricinctus Isely, 1917 occur in the west. Biology. 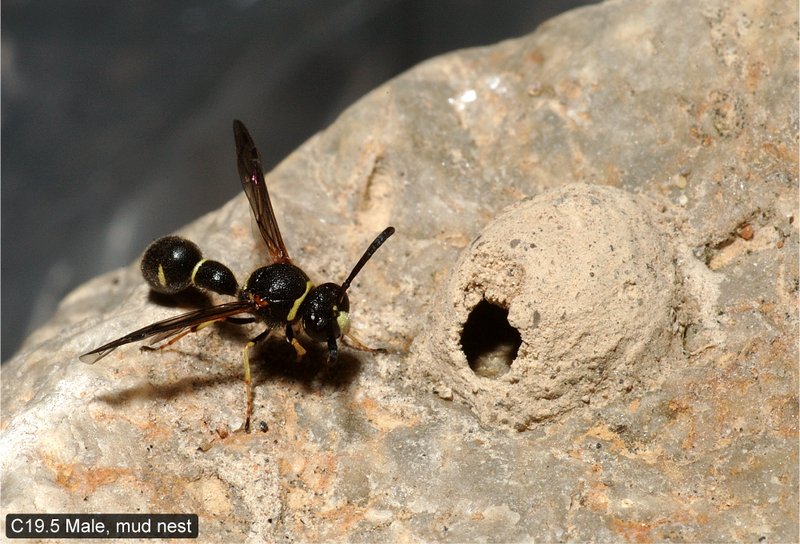 The nest of E. verticalis is recorded here for the first time (Fig. 19.5). Unlike other species of Eumenes it is attached to rocks and is hemispherical (rather than spherical). Even though we have examined only one nest we assume rocks are the usual choice of substrate because of the habitat preferences of this species. Unlike the common E. fraternus and E. crucifera, the rarely collected E. verticalis prefers sparsely vegetated habitats like empty lots, gravel pits and rocky shorelines. Prey are probably caterpillars, as in other species.